Discussions Magazine Music Blog: SPAZ views the ALICE IN WONDERLAND: Classic Film Collection DVD! SPAZ views the ALICE IN WONDERLAND: Classic Film Collection DVD! So, what do you think of when you hear the words ALICE IN WONDERLAND? Chances are you think of the original Disney animated full length feature or Tim Burton's latest creation, right? But what many folks don't realize is that there were many versions of this classic tale committed to celluloid before and after Disney's epic 1951 version and there will probably be many after Tim Burton's 2010 retelling of this story. 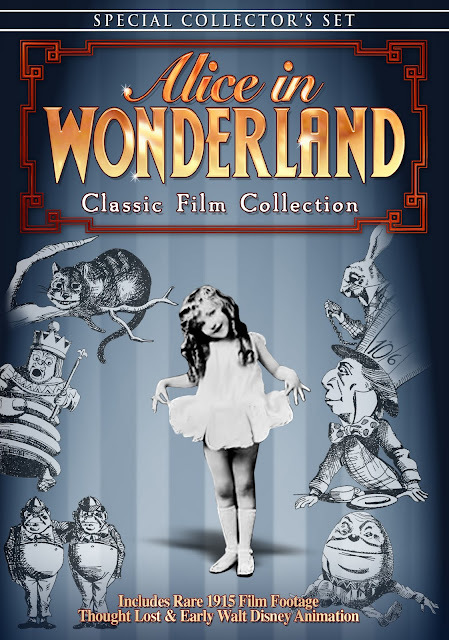 So, if you are a fan of AIW and are anxious to view other interpretations of this wonderful Lewis Carroll classic, then look no further than this DVD, which contains a handful of films that span the years 1915 to 1972, all of them worthwhile. Alice in Wonderland (1915) The first version near to the novel, this silent movie starred Viola Savoy. Though many believe the film to be lost in its entirety, includes all 52 minutes. Produced long before CGI, the creatures are costumed actors and the absence of dialogue creates a surreal, dreamlike quality. While I have NOT seen Tim Burton's version of the film, I cannot imagine it being stranger than this version. It is a silent film that plays out like a homeless community theater project gone horribly weird... and enormously entertaining. It is not supposed to be unsettling, but since visual special effects were less than primitive at the time, the sight of costumed actors playing 'enchanting characters that we have all come to know and love is strange indeed. Especially unsettling is when the Cheshire Cat's body disappears, leaving a stuffed costume head sitting on a tree limb. Yes, that is right. Not a smile, as the story goes, but a stuffed costume head. The whimsical tale looks almost ugly at times, but not in a negative way. It is very charming, but in a late night Spanish TV channel kind of way! Best of all, it is totally worth your time as you view this adaptation of the film that is closer to the book's twisted charm than any version that has come since. If you thought Lewis Carroll may have been taking some bong hits while writing the book, prepare yourself for a film that will make YOU feel as if you're smoking some pretty strong stuff! Consisting of two cartoon shorts, these don't seem to have anything to do with the original Alice story, apart from the name Alice. But I'll be damned...I love 'em to death. Early Walt Disney animation is just as engaging as anything that came later and these two animated shorts are fun as hell. Both "Alice Rattled By Rats" and "Alice In The Jungle" feature a live action Alice (portrayed by two different child actresses) at the beginning and end of each cartoon, but she is non-essential to the plot. The bulk of these shorts feature a cat (cheshire, perhaps), a rat and a plethora of other animals doing silly things that cartoon characters do... and are far more entertaining than most of the new cartoons you see on Saturday mornings today. Obviously a precursor to Mickey Mouse, the cat bears an uncanny resemblance to Felix The Cat (actually, it' the other way around?) and he's fascinating to watch, especially when you realize that this is early Disney. Almost worth the price of admission alone, Alice's Adventures In Cartoonland is classic! So, if you thought all the above titles were a bit off-center, this adaptation of Alice is a live-action romp from the UK filled with classic actors... wearing customes and make up that may not pass much muster today, but are creepily engaging. If anything, I can imagine Tim Burton falling in love with this version and upping the ante some 38 years later. It is a musical, but at least it follows the AIW story. Once again, this nice slice of silly British cinema is an absolute must-see for anyone interested in the innocently strange world of imagination and creativity.. on a shoestring budget. Kind of bringing everything full circle on this DVD, the costumed actors are a bit unsettling at times... but that is the charm of this slice of Alice history.